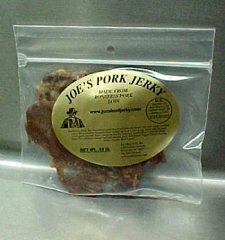 Made from boneless pork tenderloin, this is without a doubt, some of the best jerky ever made by anyone out of any type of meat. As far as I know we are the only folks making jerky from whole pork tenderloin. We slice it thin and mix the spices just right to make a jerky you have to try to believe. It is not as tough as beef jerky, makes it easy to chew and with flavor unlike any other jerky on any market anywhere. Our jerky is low in salt, high in protein, great to eat anytime and anywhere and meets all state and federal requirements for a shelf stable ready to eat product. Ingredients: Pork, Soy Sauce (water, protein extracts from soy beans, salt, caramel color), Worcestershire Sauce (distilled vinegar, molasses, corn syrup, water, salt, caramel color, garlic powder, sugar, anchovies, tamarind, natural flavor), Liquid Smoke, Texas Pete (peppers, vinegar, salt, and xanthan gum), Salt, Lemon Pepper, Garlic Powder, Onion Powder, Red Pepper.